Trump’s agenda to fight corruption is revealed, involving our youth rising up to drain the swamp. 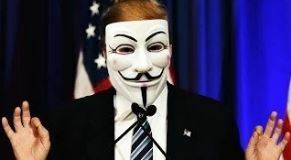 Anonymous align with Donald to drain the swamp of corruption by stampeding the wealthy 1%. More will be revealed as we activate to get our jobs back. The wealthy are desperate to keep us working class down, buy the media and claim Trump has no empathy for us working people. But … Donald knows Anonymous insists that he fulfill his election promise. SAN FRANCISCO, CALIFORNIA, UNITED STATES, November 15, 2016 /EINPresswire.com/ -- President-elect Donald Trump’s secret agenda to fight global corruption of the wealthy 1% is revealed, an agenda that involves the youth of the Globe rising up against the rigged system to drain the swamp. Donald Trump naysayers were misguided to assume that Donald planned to drain the swamp merely by becoming President of the United States. Members of the Non Generation Movement (NGM) and Anonymous have now aligned with Donald to clean-up corruption by stampeding the traditional media and the wealthy 1% into exposing their biases by deploying devious practices to thwart the revolution… More will become revealed to We the People as we prepare for the post-election aftermath and activate to get our jobs back. Remember the million mask march? As for Chris Tingle… She has published some of the proposed strategies of the Non Generation Movement and Anonymous designed to bring social justice to us blue collar working class people and disenfranchised poor, strategies that will disinherit the wealthy 1%. Dr. Tingle also documents the manner by which the media vilify the words of Chris Tingle, Donald Trump, Anonymous, and all who oppose the establishment to demonstrate that the traditional media has serious bias problems that work against freedom of speech. The wealthy opposition have proven to be ruthlessly desperate to keep us working people down by buying the media and claiming that Donald Trump has no empathy for the plight of us poor - is not one of us. But think again… Donald knows that we will not be placated and that he must fulfill his election promises. And if Hillary was so smart, how come she got her lack of integrity exposed by a mere construction-kid from the Bronx like Donald? And if Donald is so psychologically flawed, how come he knows how to inspire us working-class people to help him drain the swamp? NZ code shrinks earthquake loads to 60% international standards. 20% Wellington buildings damaged. Trump wants the swamp drained. We get it.